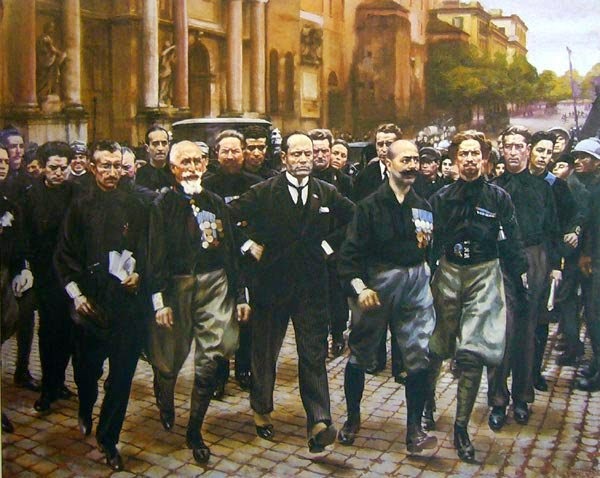 It was on this day in 1922 that the Fascist “Blackshirts” led by General Emilio De Bono, Italo Balbo, Cesare De Vecchi and Michele Bianchi marched on Rome. For years this event has been misunderstood which is not too surprising given that both the pro- and anti-Fascist sides have tried to distort it to fit their own agendas. For the Fascists, this was the bold move taken by Mussolini to “take by the throat our miserable ruling class” and by this show of force and the intimidation of his enemies, seizing power. For the anti-Fascists the blame has traditionally been placed solely on King Victor Emmanuel III. According to their narrative, the March on Rome was nothing more than a bluff that could have easily been dispersed with a simple show of force only for the King to inexplicably refuse to give the army orders to defend the city and then hand power over, submissively, to the bombastic Mussolini. Neither of these narratives are correct as both try to take some portion of truth and twist it to their own advantage; the Fascists to glorify Mussolini and the anti-Fascists to disavow any responsibility and place all blame on the King, portraying him as some sort of Fascist sympathizer from the start. The truth is that the Kingdom of Italy was in a chaotic state and while there had not yet been a full blown civil war or Marxist revolution, the prospect was not as remote as some since have liked to imply. Nor was Fascism some minor, disorganized party that enjoyed no widespread support. In 1921 the Fascists and communists had clashed in the streets of Florence, vying for power and in 1922, the same year as the march, the Fascist Blackshirts had driven the communists from power in Bologna and had taken Milan. In 1921 long-time liberal statesman Giolitti had returned to power with Fascist support; he considered them to be preferable to the Marxists. But, in the chaotic situation, his government did not long survive and he was succeeded by Bonomi who, likewise, took no action against the Fascists in their street wars with the socialists. Bonomi could find no lasting majority and his government soon fell as well, replaced by that of Luigi Facta in early 1922. In short, the established, liberal parties in Italy were proving themselves totally unable to confront the situation facing the country. There were too many divisions and too many radical elements so that many were left looking for who, among those radical elements, would be most likely to save the country rather than destroy it. In fact, the only reason Facta himself lasted as long in office as he did (and that was less than a year) was because none of the established liberal figures in Italian politics could agree to come together or wished to take responsibility for dealing with the crisis that Italy faced. Giolitti, Orlando, Salandra, none of them could get along with each other. Nitti was agreeable to joining in a coalition but stated he would sooner join a government led by Mussolini than another by Giolitti. What about the King? The King was always reluctant to intervene in politics. There were already enough republicans in the country and communist protests outside the Quirinale Palace were a common sight so that he did not want the monarchy to appear political and partisan. The idea that he played favorites is easily disproved by the fact that, at this time of crisis, he asked Turati, leader of the moderate socialists, to join the government and not for the first time. Turati refused, like so many others at this crucial point in Italian political history. 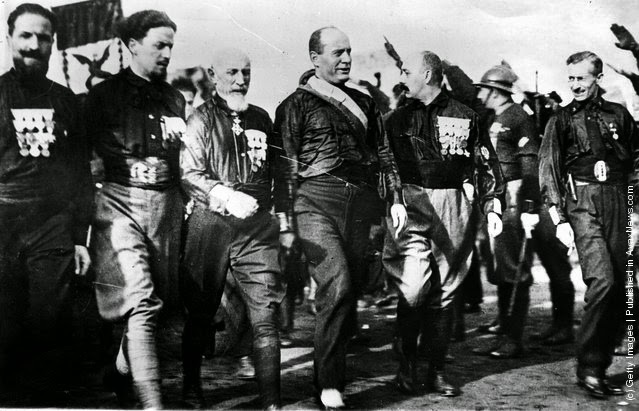 In the period leading up to the March on Rome, aside from being the only leader some felt could deal with the chaos in Italy, Mussolini was seen more and more as the only one even willing to try. 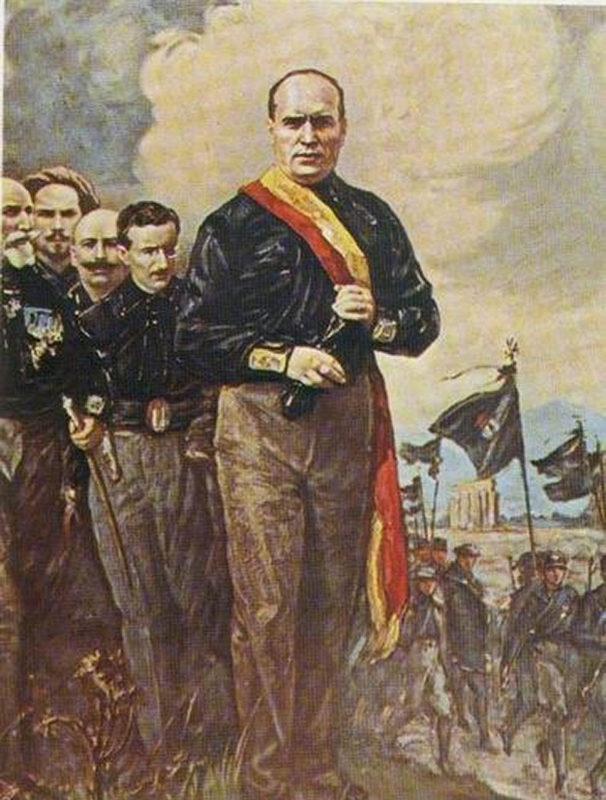 To make himself more acceptable, Mussolini began moving noticeably to the right, voicing strong support for the monarchy and making common cause with the royalists of the nationalist party. 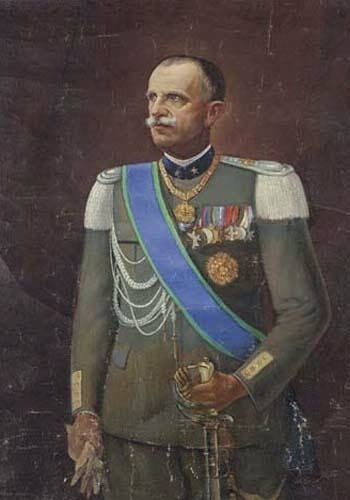 The King, even in the fall of 1922, still expected Giolitti to return to power when a suitable political coalition could be formed. However, the other liberal politicians worked against this and Mussolini masterfully played them against the elderly statesman who had earlier squelched the forces of D’Annunzio in Fiume as Prime Minister. He secretly promised his support to Facta, Nitti and Salandra against Giolitti or even against each other. Meanwhile, the old wartime premier Orlando had come out as a supporter of the Fascists, thinking them manageable and preferable to the alternative of a Marxist revolution. More and more people were doing the same and Giolitti himself took no action to try to form a government himself to offer as an alternative. Whether out of fear, indecisiveness or the presumption that all must eventually come running to him for salvation, who can say? The fact is that in this time when leadership was needed, Giolitti did nothing. The liberals who like to condemn the King for eventually appointing Mussolini Prime Minister never like to, and rarely are expected to, explain where their leaders were and what alternative they put forward at the crucial time. Finally, when it became obvious that Facta was not up to meeting the crisis, Salandra agreed to form a government that would include Mussolini and would not include the elderly Giolitti. It was at that point, with Facta still in office, that the March on Rome began to shape. Ever since, anti-Fascists have condemned the King for not deploying the army to use force to stop the Blackshirts while the pro-Fascists like to ignore the issue and pretend that they couldn’t have been stopped. The King made it clear that the order to, effectively, desist from shooting down the Fascists was his and his alone but he never revealed his reasons for this. Personally, and this is a matter of opinion to take as you please, I cannot help but feel that memories of Milan could not have but played a part in his decision. In 1898 his father, King Umberto I, had deployed the army to put down riots in Milan sparked by radical socialists. There was bloodshed in the streets and the King was widely criticized for overreacting. His eventual assassination in 1900 by an anarchist, which brought Victor Emmanuel III prematurely to the Italian throne, was done in retaliation for the violence in Milan. How could the King have known that he would ultimately be condemned for failing to do what others had condemned his own father for doing? It does seem reasonable to ask why King Umberto I should not have used force against socialists in Milan but that his son should have used force against Fascists in Rome. Why the double-standard? In any event, those who take issue with the King refusing to shoot down his black-shirted subjects in the streets like to imply that if he had done so, that would have been the end of it. But, what about all the parts of the country already effectively under Fascist control? Who can say that the movement would have stopped then and there? How do we know that the communists would not have seized the opportunity to launch their revolution and take power for themselves? Remember that there was still no decisive liberal leadership to take control of the situation. Salandra had agreed to form a government but, upon seeking support from De Vecchi and Dino Grandi of the Fascist Party, was told that Mussolini would settle for nothing less than the premiership. 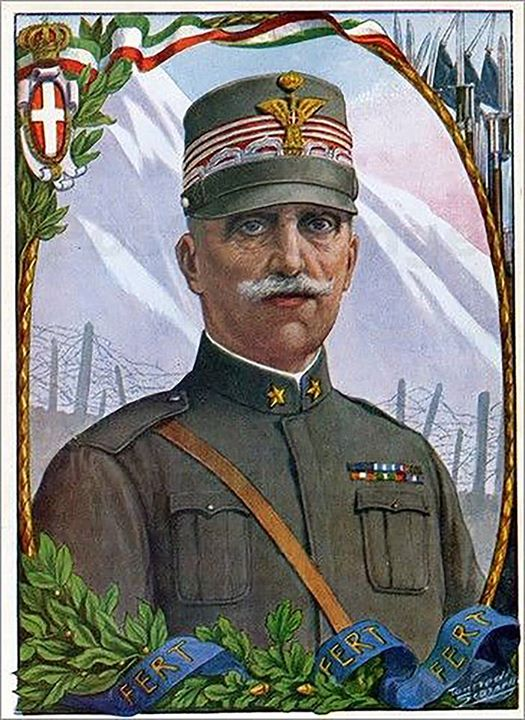 Plenty in the army spoke up for the Fascists, the leading industrialists in Milan sent messages of support and so Salandra willingly stepped aside in favor of Mussolini who, it should also be remembered, was originally appointed by the King as simply Prime Minister of a coalition government in which the Fascists were not the majority. Ultimately, the March on Rome was more of a Fascist victory parade than a bold seizure of power. Everything was worked out behind the scenes in political discussions rather than being settled by force in the streets. The King had tried to stick with the traditional, liberal ruling class but they were unable or unwilling to take action. He even tried to reach out to the moderate socialists only to have his hand slapped away. It is no exaggeration to say that, whether the King felt any sympathy for the Fascists or not, at the time they were simply the only alternative left to him and he should not be condemned for that, especially by the liberal elites who sat back and did nothing out of fear for their own positions or because they wanted to hold out for a better offer. The idea that the King and the Royal Family later came to be the scapegoats for the Fascist era and held solely to blame for the rule of Mussolini is both flagrantly dishonest and totally disgusting, especially considering the quarters such accusations usually come from. Those who are so quick to blame the King do so only because it is far too painful to blame themselves. The double standard is more obvious when you look at the modern perspectives. Although most Italians today rightly regard Fascism has having been a terrible evil, Mussolini is nowhere near as taboo as Hitler is in Germany or arguably even Franco in Spain. There was a newspaper poll done a several years ago where he was even ranked among the greatest Italians of history. So, while there is still some nuance in opinions on Mussolini, there is nothing but almost total scorn and hatred for the former monarchy. Granted, the actions of some of the royals after the creation of the republic probably haven't done much to endear the monarchy among the public, but it is ridiculous that the king is held to be more responsible for the actions of a dictator than the dictator himself. One thing Mussolini always had going for him is that, when you're always placed in the context of standing next to Hitler, you're always going to look better in comparison. The Fascists were also never as racist or genocidal as the Nazis and that's what modern people find most objectionable about Hitler. He could have been just as authoritarian, just as oppressive and just as aggressive and no one would really care -but he was racist too so, bad guy #1. What always stood out to me as the most blatantly unfair thing about post-war Italy was that the Royal Family was exiled, not just King Victor Emmanuel but the whole Royal Family including King Umberto and Queen Marie-Jose who were both anti-Fascist and yet the Mussolini family got to stay in Italy and Mussolini's granddaughter has even made a political career for herself. I'm not saying the Mussolini clan should have all been exiled and banned from politics but banning the Savoys because of Mussolini and not banning the Mussolinis themselves seems blatantly hypocritical and vindictive. LOL! You’re right! Whenever a monarch does something wrong, they call out for the King’s head and the end of the Monarchy. However, when a president screws up no one says down with the republic. Probably, innately they know that after republic there is nothing but anarchy and of course the subsequent tyranny. So, despite their reputation, “the children of the left hand” still fear the rise of the children of Chaos.